Are you planning a trip through one of the country’s biggest airports? Dallas/Fort Worth Airport (DFW) sees millions of passengers every year. 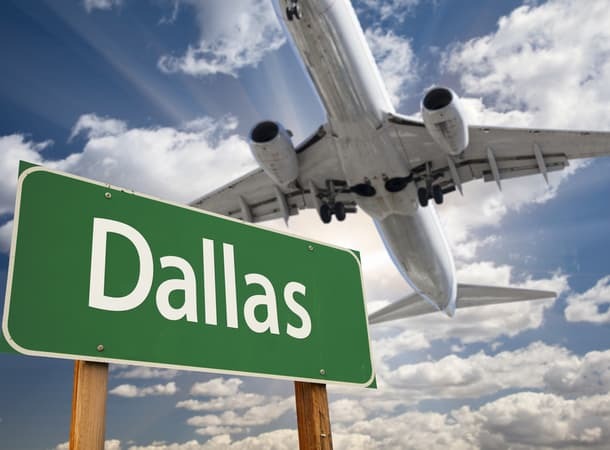 With National Charter Bus Dallas handling your group’s ground transportation, the task of traversing the airport will be a little less daunting. We’ll provide your travel group with a comfortable full-sized shuttle bus or minibus to get you to, from, and around the massive airport. Private charter bus transportation will make your DFW trip easy from beginning to end. Our rental experts are available around-the-clock at 214-206-1981 to assist you in organizing your group transportation. 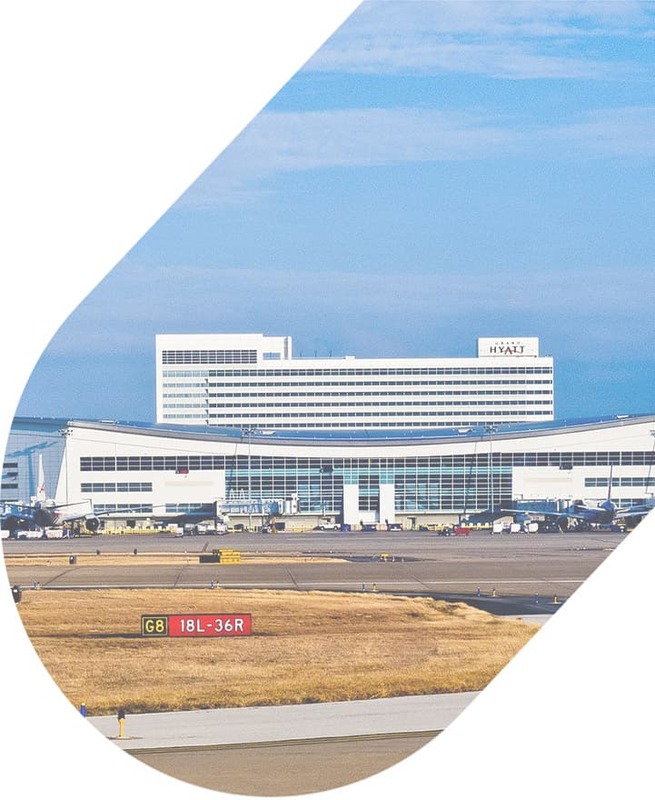 Accommodating over 60 million passengers every year, the Dallas/Fort Worth Airport is one of the busiest airports in the nation. DFW Airport serves as the main hub for airline giant American Airlines with about 900 daily flights leaving from its terminals alone. Airline carriers service a total of 248 destinations internationally, making DFW one of the most connected airports in the US. Along with being one of the busiest airports, DFW is considered the second-largest airport by land size in the country. Sitting at an equivalent size to the island of Manhattan, DFW Airport has its own postal code and post office. Business travelers and high-tech passengers will be happy to know that DFW Airport ranks as one of the most technologically savvy US airports. WiFi at the airport is free and there are public travel lounges in three of the five terminals with power outlets and workstations. Travelers in a pinch can rent a Minute Suite which can include business stations, daybeds, computers, and showers. Among America’s many busy international airports, DFW offers some of the best air travel experiences for passengers. Compared to many other international airports, DFW is actually considered easy to navigate with its streamlined terminal system. 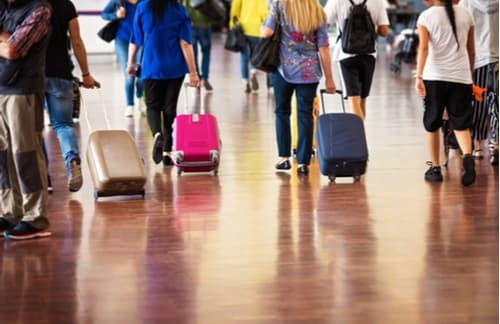 Though, once you consider complications associated with group travel, getting to or from the massive airport may seem more difficult. Due to the airport’s sheer size, passengers traveling in large groups may find transportation and organization to be an issue when arriving or departing. Splitting your group into multiple vehicles will make parking, regrouping for check-in, and taking on TSA lines even more hectic. A private charter bus rental will keep your entire group together throughout the arrival or departure process. If you’re flying out of DFW Airport, parking per day can cost upwards of $24 a day, per vehicle. These fees can quickly add up for groups needing to park more than one vehicle for an extended period of time. Each private rental includes a professional driver to organize the drop-off or pick-up for your group. Your group can completely skip the hassle of driving and parking with a rental from National Charter Bus. Along with a streamlined departure or arrival process, a private charter bus rental will give your group time to relax before or after your flight. If you’ve been stuck on a plane for hours coming from major cities New York City or Boston, the last thing anyone wants to take on is the Dallas-Fort Worth roads. Everyone in your group can sit back and relax after a long redeye flight in a climate-controlled charter bus with plush, reclining seats, on-board WiFi, televisions with DVD players, and more. Leave the driving up to National Charter Bus and your professional driver for your entire trip. Groups traveling into Dallas-Fort Worth for trips like private group vacations, family reunions, business conferences, and other large-scale events can rely on a private charter bus rental for transportation needs beyond the airport. Once your group arrives into DFW Airport, a private shuttle can be used to transport your group to locations throughout the metro area. From lodging to business centers and local attractions, National Charter Bus is here to ensure your group travels based on your own unique itinerary. A private charter bus will also give your group the freedom to travel between Dallas and Fort Worth without hesitation. Don’t worry about making the deadline to hop on a hotel shuttle or waiting to hail a rideshare large enough to accommodate your group. The buses we charter come in a variety of sizes, ranging from 18-passenger minibuses to full-sized 56-passenger motorcoaches. No matter the size of your group, everyone will be comfortable in a spacious shuttle bus manned by a professional driver. At National Charter Bus, we pride ourselves on making the rental process easy for every passenger. When you call our offices at 214-206-1981, our rental experts will help you choose the best model of bus for your travel needs in DFW. We’ll also pair your group with a local, professional driver to handle your transportation for your trip. We’re here 24/7 to assist you!